from Brazil vol. 61 2012.07.26 A report from the conference that shapes our future, "Earth Summit 2012 Rio+20"
Once in a decade opportunity to help shape Earth’s future. What can Japan do over the next 10 years? I recently took part in the “Earth Summit,” United Nations’ largest international conference organized once every decade. 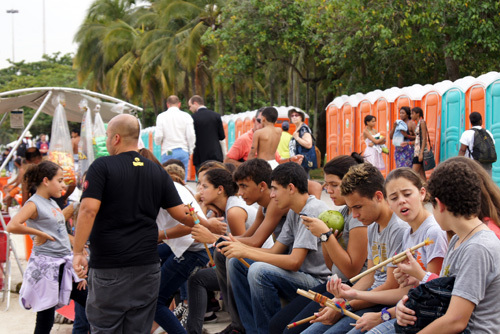 This year, it was held for 3 days from June 20 to 22 in Rio de Janeiro, Brazil. Some of you may recall a famous speech made at the Earth Summit 20 years ago. These words were spoken by a 12-year old girl at the Earth Summit held in Rio back in 1992. 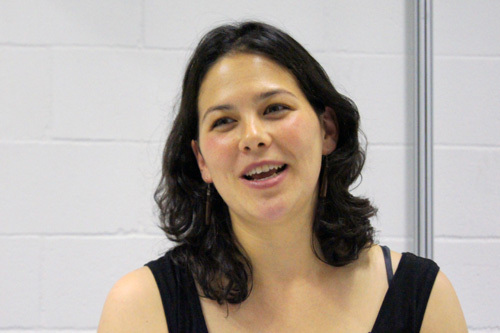 The story of this legendary speech by Severn Cullis Suzuki has been told and retold. Back then, she lived in Canada and had saved up her allowance to travel all the way down to Brazil. She must have wanted to do everything in her power to take part and express herself at the Earth Summit, where her future was going to be discussed. Twenty years have gone by since. The conference, held every 10 years, has returned to Rio. Because it has been 20 years since the last Earth Summit in Rio, the Earth Summit 2012 is referred to as Rio+20. Photograph: Severn Suzuki making her speech at Rio+20. 目次へ移動 Once in a decade opportunity to help shape Earth's future. Brazil is on the other side of the planet from Japan. There is a 12-hour time difference between Brazil and Japan, so when it is 7:00am in Rio, it is 7:00pm in Japan. And when it is summer in Japan, it is winter in Brazil. Having said that, the temperatures in Rio during this time of year range from around 25 to 29 degrees and the humidity is high, so the climate is much like the summers in Japan. I stayed in Copa Cabana, a famous beach resort in Brazil. Many other Rio+20 participants were also staying there. The men in suits stood out like a sore thumb in the beach resort. 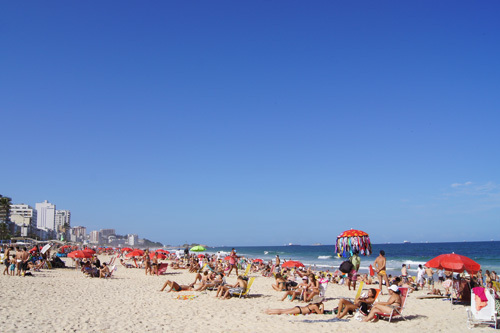 The beaches in Rio are super crowded during the weekends. Although the month of June is actually winter, it still gets quite warm, so you can enjoy a swim in the ocean. I received an invitation from the UN to take part as a member of the NGO, "Earth Summit 2012 Japan." All participants were issued an accreditation card that we wore around our necks. When I got to the shuttle bus stop, there was a long queue of Earth Summit (Rio+20) participants. The Brazilian government provided complimentary shuttle bus service that all participants with accreditations could take advantage of. I got on the shuttle bus from the Marriott Hotel on the Copa Cabana beachfront. After being rocked to and fro for 40 minutes, we arrived at the main venue for Rio+20. Many government representatives take part in the Earth Summit, so entry into the main venue was only permitted to individuals with UN issued accreditations. We also had to pass through metal detectors, so security was as tight as when boarding a plane. Not all organizations are issued accreditations, so some stood near the entrance with placards to communicate their message. The global population has surpassed 7 billion, and our world is facing serious problems like never before. How can we help create a sustainable, peaceful world? The Earth Summit is a once in a decade opportunity for people around the world to come together, to recognize the issues we are facing, to discuss what needs to be done, and to share a common vision for the future. That is why, although some organizations including NGOs and NPOs were unable to get into the main venue, they bought a ticket down to Rio to get their message across. If issues get recognized at the Earth Summit, then they become more widely recognized around the world. UN conferences may seem like they are in a completely different world, but the Earth Summit incorporates many unique ideas to bring the summit closer to all of us, so that we can all feel as though the summit concerns us, too. The UN recommends the establishment of a "National Preparatory Committee" leading up to the summit through the "Multistakeholder Process." The "Multistakeholder Process" gives various stakeholders an opportunity to meet on equal ground and share their thoughts and ideas. Perhaps this reflects the summit's desire to get everyone involved, to communicate that the summit is not just for a certain group of people, but it is for all of us, who live on this planet. The entrance to the main venue. 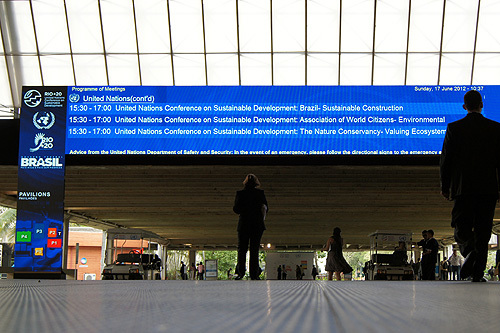 The screen, which also served as a gate, displayed conference topics and timetables. 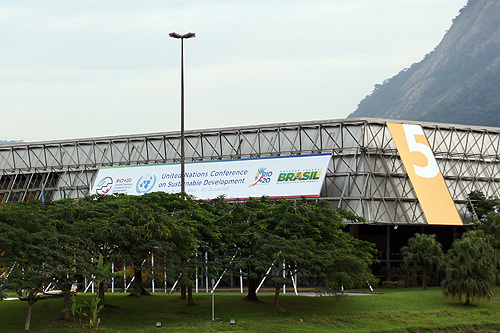 The "summit" involving national leaders was held from June 20 to 22, but key representatives (mainly government officials) from each country traveled to Rio days before the conference began. Why was that? They arrived in Brazil well in advance of the conference to negotiate with other countries to finalize the "outcome document." An "outcome document" has no legal binding power, but is a public declaration of the voluntary commitment of each country. These documents will serve as a loadstar for the future over the next 10 years. Earth Summit participants actually get to witness these negotiations taking place. Government officials from Japan were also present. Watching representatives discuss and negotiate the merits and demerits for each country, for the world, under the leadership of the chairperson was very exciting. These negotiations took place for over 8 hours every day. I will describe these negotiations in more detail later. NGOs, private companies, and other organizations hosted various events alongside these negotiations from around June 13. Many workshops and seminars that gave people an opportunity to share latest information on efforts being undertaken around the world and to get to know new people working in the frontlines of a wide range of fields such as the environment, biodiversity, and energy were also held. These events are also what make the Earth Summits exciting. Each country's pavilion showcased projects spearheaded by government administrations and products and services private companies offer to help realize a sustainable society. 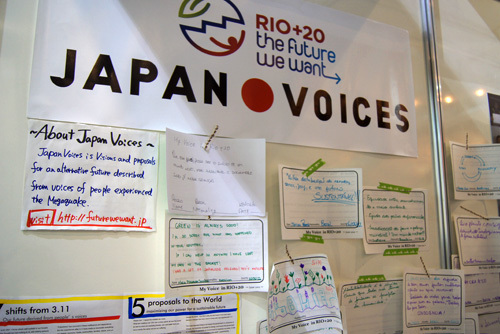 "Japan Voices," a project introduced in the Japan Pavilion, which encouraged Earth Summit participants to share their vision for the future and their messages for Japan. The "People's Summit," a rival event organized by the people, was also held during the same period. Earth Day has become quite well recognized in Japan. The People's Summit is a similar event, but bigger. Organizations especially NGOs took part to promote their causes. 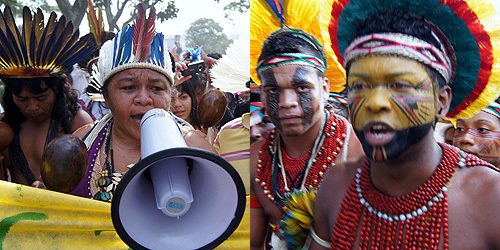 Indigenous people, NGOs, and many citizens participated in the People's Summit. The summit was held in a vast park, and participants enjoyed taking part in a wide range of activities. A demonstration organized by the indigenous people at the People's Summit. They asserted their rights and promoted their causes while playing unique music. Most of the information we saw on TV or in the papers about the Earth Summit 2012 (Rio+20) was about the 3 days of the actual conference, from June 20 to 22, but events held before and the process of finalizing the outcome document is actually the real highlight of the event. 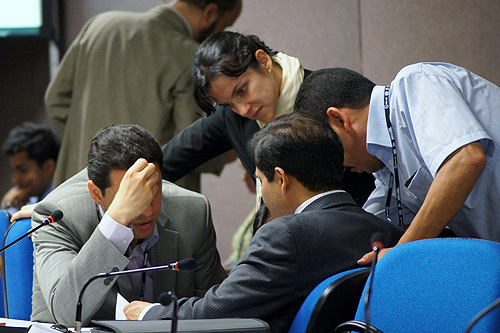 This time around, the negotiations that took place before Rio+20 continued until the last minute. Hopes and expectations of people from different standpoints are reflected in these negotiations. I would like to tell you about some of the people who were involved in the discussions. Many people may recall the "legendary speech" by 12-year old Severn when they think about the Earth Summit. She asked the adults and the world to stop destroying the environment if they can't fix it, but what are her thoughts now? And has the world been able to live up to her expectations? 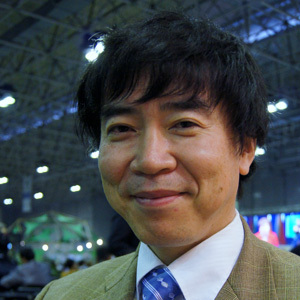 Severn Suzuki's participation was announced right before the Rio+20 took place. She wasn't planning to take part, but the NPO "WE CANADA" contacted her directly and asked her to take part. Perhaps it was because her participation was announced suddenly, but the venue wasn't completely full. I was not only able to take advantage of this very rare opportunity to listen to Severn speak about the last 20 years, but I also got to speak to her afterwards and ask her a few questions. Severn Suzuki returned to the summit after 20 years. She was very genial and also very charismatic. Severn, who stood up in front of the crowd once again in Rio after 20 years was no longer a little girl, but a mother of 2 children. Twenty years ago, she shared her thoughts as a 12-year old girl, but the message she delivered this time was even more powerful. "This time, I'm not fighting just for my future. I'm fighting for the future of my children." Now a mother herself, she underlined the importance of preserving the environment for her own children and for all children of the next generation. The NPO "WE CANADA," who realized Severn's participation, had organized many Earth Summit dialogues, so that the voices of the people of Canada would reach the Canadian government and could be heard at the Earth Summit. Severn explained that she felt a connection with their desire to deliver a diversity of citizen voices. "We must tell the world what is going on. We must speak out to the media. We need to tell whatever media. We need to tell everyone we can. We need to tell the people back home what is happening, what the position of Canada is at these negotiations. This is something we can bring back home," explained Severn. This is true for other nations, too. When she was 12 years old, she took a stand in front of the whole world. It was great to see that her beliefs were still just as strong. She became famous overnight at the Earth Summit 20 years ago. Thereafter, she made numerous TV appearances and has become widely recognized as an environmental activist. Nevertheless, she explained that people still introduced her as "the girl who spoke at the Earth Summit." This must be because her words from back then, "If you don't know how to fix it, please stop breaking it" still resonates with people across the world. Twenty years ago all she could do was ask, but now, after all this time, she clearly states what she believes the planet needs. So she seems to have found her own way of helping to fix our planet. "The most powerful tool belonging to the human race. This power is the power of inter-generational love... The strongest moral imperative that we have to act and change is our children. It is because of children that we will bring back the connection between cause and effect, between choices, the global situation, between privilege and responsibility. In identifying our moral imperative lies our hope, and our hope is love. Love for our children... This is the most powerful opportunity we have for change." The crowd gave her a big round of applause. Even if someone else had spoken the same words, they may not have had the same impact. Her delivery was emotionally stirring because of the "unwavering intensity of her desire," the "career" path she has chosen, and her experiences as a mother. What especially left a strong impression was her message for the children who were now around the same age as she was 20 years ago. "My advice to youth is to speak the truth, find ways to educate yourself, and to speak up. Use your voice. The world needs to hear, and the world will listen." Looking back on the past 20 years, Severn said, "We have not even come close to achieving the sustainable world that we knew we needed back then." So she hopes that children will stand up like she once did so that together they can change the world. Severn explained, "I've heard it said that there was a lot more hope back in 1992. Definitely there was a pretty amazing energy there. I feel like 20 years later, now the Internet has been invented, we have unbelievable communication. We have access to information. And we all know what's happening to the planet... I think the big question is, can we work with government. And I think that that is all what we need to ask in the next few days and see the results of what happens. We are all here in good faith that we can talk to our governments that it does matter that we're here lobbying, trying to push the negotiators. We all believe that this system works. And if it doesn't, then after Rio, we need to start a movement, we need to raise some hell about why doesn't it work. Because I believe there is real crisis in governance here, and we need to be the watchdogs, and we need to raise our voices if it doesn't work." Will her answer, "love," save the planet? We will have to wait and find out as the fight to protect our futures still continues. The outcome document outlines specific tasks under 7 key issues we currently face - jobs, energy, urbanization, food, water, oceans, and natural disasters. One of the reasons why the Earth Summit was held in Rio once again was that all of these problems are prevalent in Brazil, a rapidly developing economy with an increasing population. The 3 days of the summit held here in Rio and the negotiations that take place beforehand will carve a path to the future. But carving this path is an extremely difficult process. The Earth now supports 7 billion lives, but each country's position and the kind of society it aspires to become differ. I spoke to an environmental journalist, who served as the co-chairperson of the National Preparatory Committee, Ms. Yuko Sakita, about the discussions that took place. At the food court in the main venue. 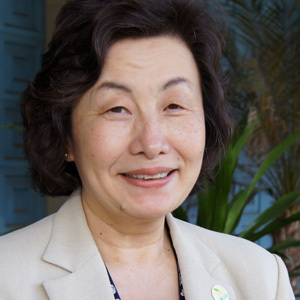 Ms. Yuko Sakita is an environmental journalist and served as the co-chairperson of the National Preparatory Committee. "We took part in Rio+20 initially hoping that discussions about how to realize an eco- conscious society will take place. But when we saw what discussions were taking place, we realized that there was a really big disconnect between the way developing and developed countries think." Ms. Sakita has co-chaired the National Preparatory Committee in Japan since last summer. She has spoken to multitudes of stakeholders and proposed to have the results of such discussions reflected in the outcome document. She traveled to Rio to see how their efforts will be incorporated in the outcome document. "Developed and developing countries must look to the future together. Developing countries should not try to force their views on countries that wish to develop, and thereby create a developed country versus developing country structure. Of course developing countries will need assistance, but such aid should be provided in a different way, and they should be able to negotiate their needs differently. In the past, developed countries supplied aid and developing countries received the aid to try to catch up to developed countries. But rather than conducting such negotiations, countries need to sit down together and talk to each other. Japan was trying to propose this, but it is quite difficult to change status quo." Ms. Sakita explained that it is important to take each country's position into consideration, and then define the direction in which we should all head towards. Moreover, Ms. Sakita also believes thatby adding "culture" to the triple bottom line - "environment," "economy," and "society," - when discussing the future, we would all be able to pay respect to other countries, nature, and to indigenous peoples while helping resolve our planet's problems. "It was great too see people from many different countries exchanging ideas. I hope that this will provide an opportunity to establish new values and help create a large movement." As I mentioned before, the Earth Summit is UN's largest international conference. There are many people that lay everything on the line for this. But the outcome document that was drafted here are only indexes for the future. What is really important is what the world does afterwards, and this also affects our lifestyles. The Earth Summit is a milestone and also a starting point. The outcome document is adopted at the actual Earth Summit, and the 3 days leading up to the summit, June 13, 14, and 15 were days put aside for pre-negotiations. Having actually watched the negotiations take place, I noticed that the atmosphere in which government officials discussed the various subjects included in the outcome document was quite tense. Government officials discussed, for example, the topic of "sustainable production and consumption" ad nauseum in order to reflect their needs and hopes in the document. And at times, they negotiated separately with countries that had opposing opinions to try persuade them. That is why this entire process is referred to as "negotiations." The needs of developed and developing countries differ often, and the main issue becomes to what extent each side is willing to make concessions. For example, developing countries want developed countries to provide financial aid, however, facing unparalleled economic recession, developed countries may not be able to provide the expected level of funds. On the other hand, develop countries want to get a better grasp of the natural capital each country, including developing countries, has, but developing countries object to this as they do not have the resources to conduct such research themselves. Such discussions take place for a wide range of issues. People making a protest at the main venue because their voices were not reflected in the outcome document. 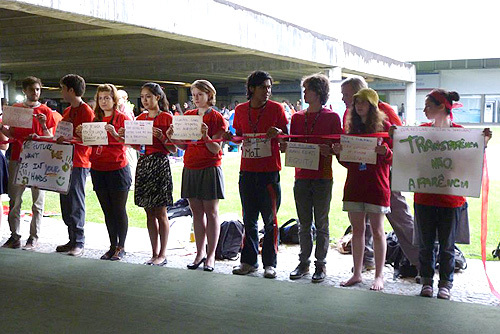 The action group is called "Our Red Line" and mainly consists of youths and women (photograph provided by: Anna Davidson). Pre-negotiations regarding the outcome document. As you can see, participants have their heads in their hands, as discussions are often quite complicated. The details of such discussions must be treated with utmost confidentiality until the main conference takes place. So I had to go through rigorous security checks to enter the negotiation room. I was able to go inside because I was a member of the NGO that was invited by the UN to take part in the Earth Summit, but ordinarily media cannot take pictures or video or even enter the room. When I was inside, I heard camera shutters every time the door opened as photographers tried to take pictures to capture a glimpse of what it was like inside. Negotiations take place under the leadership of the chairperson, and they last for more than 8 hours a day so many breaks are necessary. These efforts help draft the outcome document, which are introduced and adopted at the main conference by the leaders of state. Having said that, at Rio+20, leaders were unable to finalize the outcome document at these pre-negotiations. But the dates of the conference were fixed, so how did these countries finalize the outcome document even though discussions were not going anywhere? After June 15, the final pre-negotiation day, Brazil, who had chaired these discussions, finalized the outcome document. But the words spoken by the chairperson is a good indication of how difficult the negotiations had been. The draft created by the chairperson was a very bold one. He decided to leave out all parts that countries could not agreed to during the pre-negotiations. His words reflected each country's unwillingness to compromise. The outcome document was created based upon the chairperson's draft, but how was this outcome document appraised? I spoke to Mr. Naoya Tsukamoto of the Ministry of the Environment who took part in these negotiations as a member of the Japanese government and Mr. Toru Hattori, Chairman of the General Incorporated Association CEPA JAPAN who took part in the summit as an NGO. Mr. Naoya Tsukamoto of the Global Environment Bureau, Ministry of the Environment. He spoke calmly, yet with passion. Mr. Tsukamoto said without hesitation, "The outcome document does not contain anything new," but he endorsed the document with respect to the issue of green economy, which has been featured on the news and is drawing increasing attention, saying, "despite the conservative language, hopefully the government leaders will start paying more attention to it now that this topic has been included in the outcome document." "It's easy to understand if we compare it to an illness. Think of our current economic activities as an illness and green economy as the cure. If you use it well, you can recover from the illness, but at the moment, only the side effects are described in the outcome document. The language used wasn't very aggressive. But we hope that its inclusion in the document will lead to more and more people realizing how important investing in the environment really is." Mr. Tsukamoto also praised Rio+20 because developed and developing countries were able to define a common goal. The "Millennium Development Goals (MDG)," which are objectives to be achieve by 2015, indicate the basic human needs of developing countries that developed countries will help address, but a new set of goals were established at this Earth Summit. These are called, "Sustainable Development Goals (SDGs)." "We hope that the reexamination of societies in developed countries that mass produce and mass consume and sustainable, eco-conscious development will be included in the SDGs. Until now, developing countries followed the path developed countries have taken to catch up, but we would need to live on an endless number of planets for that to happen. What is necessary is to have the goal, but to take a different path. Developed countries have tasks we must undertake, and developing countries must aspire to advance in a way that doesn't impact the environment. We must all cooperate with one another to etch out a new path for development." Mr. Tsukamoto spoke passionately about the importance of going down a path that is different from the one we have traveled in the past that concentrated on economic development. Mr. Hattori, who took part in the summit as an NGO, believes that the contraposition between developed and developing countries is a good thing. "Some people believe that the negotiations were a failure, but I don't think so. Although the opposing viewpoints of developed and developing countries became clear, you could say that developing countries were able to stand their ground and negotiate their positions. 'Sustainable development' - who does it benefit? I find it very invigorating that developing countries have become able to voice their opinions when discussing issues that affect our planet." Many people, including the media, were quite worried because negotiations continued until the last minute before the outcome document was adopted, but in the long term, this was quite a positive development. Mr. Toru Hattori, Chairman of the General Incorporated Association CEPA JAPAN shared his thoughts in the break room at the main venue. 目次へ移動 What can Japan do over the next 10 years? As I mentioned, the outcome document adopted at Rio+20 will serve as a loadstar for the next decade. So what should Japan do and what kind of future should we aim for? 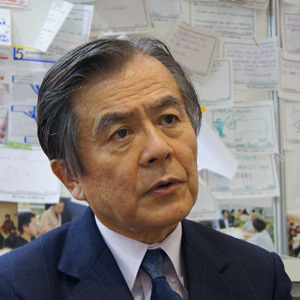 Mr. Hiroshi Komiyama, Chairman of Mitsubishi Research Institute, who co-chaired the National Preparatory Committee with Ms. Sakita, believes that Japan could become a new model case. "China and the United States together emit half of the world's total CO2. It may be difficult for these 2 large nations to drastically reduce their CO2 emissions over the short term. But for Japan, this is doable. Using resources correctly and by also taking advantage of our technologies, we can become a successful case example for the rest of the world." Mr. Hiroshi Komiyama, Chairman of the Mitsubishi Research Institute and co-chairperson of the National Preparatory Committee. I was able to interview him in the Japan Pavilion. Mr. Komiyama spoke about the forestry industry as an example. "What countries do you think export timber nowadays? Main exporters are the United States, Canada, and New Zealand. If we take a closer look at these countries, we see that the lumber industry is a very important and a large industry for them. What about Japan? Has the lumber industry in Japan been industrialized? Using one's resources properly and establishing an industry also creates jobs. Tackling and reducing the problems we face one by one will help the development of a sustainable society." Mr. Komiyama explained that by becoming a self-sufficient country, Japan could become a shining example. Participants gathered at Rio+20 to find an answer to the statement Severn Suzuki made 20 years ago when she was 12, "If you don't know how to fix it, please don't break it." Perhaps the key lies in Mr. Komiyama's message. "The most valuable outcome of the Earth Summit 2012 is that people sat face to face to discuss the various issues. Internet has become widely available now, and with more and more people using SNSs like Twitter and Facebook, the world has really become a small place. But we need to sit face to face to resolve our issues. The Internet has enabled many countries to take apart the issues and tasks they face. But what then? Governments alone can't change the world. It's important for citizens, scholars, and many others to sit down at the same table to discuss the issues." After having worked as an editor/journalist for a publishing company, in 2005, he established the digital marketing company, N Plus, Inc., which provides consulting, planning, and execution services for business development and marketing. 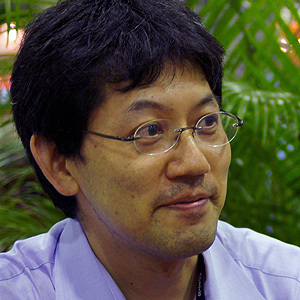 He introduced the digital publication, "Japan Voices" at Rio+20 as a member of the NGO, "Earth Summit 2012 Japan." His publications include "Communication HACKS!" and "You Money - A free key to growing your savings and to self improvement."